This DIY was inspired by A Bubbly Life and all the sparkle DIY's out there at the moment, such as my Starbucks Sparkle Travel Mug DIY. What you will need for this DIY is Mod Podge, Nail polish, Sparkles, Paint Brush, Tape, and a Key. First you need to tape the bottom of the key on both sides. This way you have a perfect line, and you don't get glue and sparkles on the part that unlocks your door. Next you need to apply Mod Podge to both sides of the key. Make sure there is no excess. 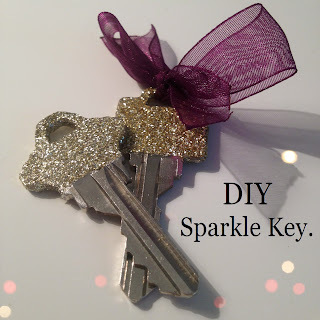 Next shake your sparkles all over the Mod Podge, so the key is completely covered. Now you need to let it dry for about an hour. Next, add a coat of clear nail polish over top. You need to do this, or the glitter will come off everywhere! Let the nail polish dry. What you can do is stick the key in the lock so you don't have any smudges. You may need to add two coats of clear nail polish. Make sure the key is dry before you use it. I added a ribbon to one of my keys, for when I am going out and want to slip it in my wristlet. Hope yours turns out well!